The Lagotto Romagnolo is a breed of dogs that originated in Italy in the sub-region Romagna. The name of this breed has been derived from an Italian word lago which means lake, and thus the name means “lake dog of Romagna”. It has been used as a water retriever and hunter and is known to be the only purebred dog in the world that can hunt Truffles (edible fungi). It is not a large dog, ranges in between small to medium in size. 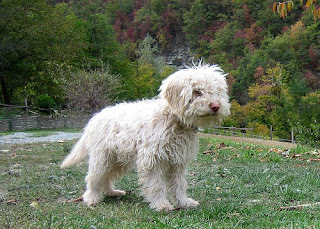 Lagotto Romagnolo is a lively well built dog with peculiar scenting powers and observant, smart and soft expressions. Being a devoted and a loving breed, it makes a good family pet and also does well with dogs and animals that they have grown up with and also get along with children. They are highly attentive and have the capabilities of warning their family about any visitors and threats. They need to be combed on a daily basis in order to keep the coat free from matting and professional clipping of their woolly coat also needs to be done twice in a year. However, they may be bathed only when necessary. It is thought to be a hypoallergenic breed. They are very smart and have a likeness towards learning. Thus they are easily trained; however, training needs to be done justly, patiently, constantly and with positive approach and harsh methods should be avoided. This breed is not apt for apartment living and novice owners, because they need a lot of exercise along with mental stimulation. They love digging and for this reason precautions must be adopted to protect the landscape. Moreover, they should not be left unattended for a long period of time as they may become bored and cause damage. They are best suited to a rural environment with some work to do.